The StudyBed Company Ltd is committed to protecting your privacy. Any personal data you provide to us is stored securely and confidentially and is processed in accordance with the requirements of the data protection legislation in the UK. 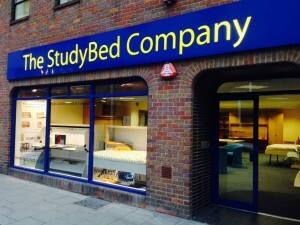 We are The StudyBed Company Ltd whose registered address is International House, Station Yard, Thame, OX9 3UH. Company No. 5912743. When you contact us via telephone, email, our online contact form or in person we hold any personal data that you provide to us such as your name, address and contact details as well as a brief description of your enquiry. When you place an order with us we require your name, address, email address, telephone number and payment information. Any data collected from our website is solely used to help us track and improve the performance of the website and our online advertising campaigns. The data collected when you contact us enables us to provide you with the information requested and helps us to maintain our high standards of customer service. It also helps us to monitor how successful our marketing strategies are and identify where we can improve. When you place an order with us the information requested is required to enable us to process and fulfil your order. We appreciate that very often the initial enquiry for our unique StudyBed product is the start of a long-term planning process. We may very occasionally, on a one-off basis, inform you of some updated information we may feel of relevance to you, such as an impending price increase or notification if you are located in a remote part of the UK and we are planning a delivery visit to that area. At any time in the future, should you definitely not wish to hear from us again, please let us know by emailing enquiries@studybed.co.uk. Cookies are files that store information on your hard drive or browser so that a website can recognise that you have visited it before. They are widely used to enhance the usability of websites. You can, should you wish, disable the cookies from your browser and delete all cookies currently stored on your computer. We may disclose personal information to trusted third party service providers solely for the purpose of completing a task, for example, accounting or email marketing. Only the personal information that is necessary to complete the task will be disclosed and any information is only shared with companies who comply with the UK data protection legislation. We know how important it is to keep your personal data secure. We use computer safeguards such as firewalls and passwords to keep information safe. We only authorise access to personal data to employees who need it to carry out their job responsibilities. In the unlikely event that we do suffer a security breach which compromises our protection of your personal information and we need to let you know about it, we will do so. However, whilst we take appropriate technical and organisational measures to safeguard your personal data, please note that we cannot guarantee the security of any personal data that you transfer to us. You have the right to withdraw consent for your personal data to be processed for marketing purposes at any time. You also have the right to ask us to provide you with a copy of the personal data we hold about you and in some circumstances you can ask us to erase the data we hold. To exercise these rights, or if you have any queries or concerns regarding how we use your personal data, please email enquiries@studybed.co.uk.